Notes: Duo Leads Denver - College Hockey, Inc.
Borgstrom, Gambrell in the spotlight as Pioneers chase consecutive titles. 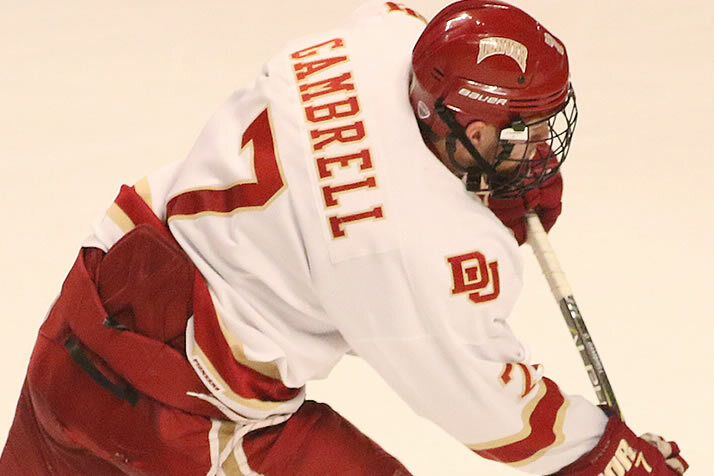 Dylan Gambrell ranks second among juniors in college hockey and fifth among all players with 123 career points (Photo by Larry Radloff). Woods, Alaska in playoff push – The WCHA is the one conference where not every team makes the playoffs, and Alaska enters its final four regular-season games in the seventh of eight available spots. Nanooks defensemen have accounted for 24 goals, most of any team in the nation, including 8 from senior captain Justin Woods (Fairbanks, Alaska/Lincoln-USHL). Woods is enjoying the best season of his career, one which was interrupted in 2014-15 when he was diagnosed with Ewing’s Sarcoma, a rare form of bone cancer. Last month he celebrated three years cancer-free. Cornell’s next goalie star – Cornell’s goaltending tradition – which includes Canadian Olympian Ben Scrivens and the legendary Ken Dryden – has found its next star in freshman Matthew Galajda (Aurora, Ont./Victoria-BCHL). Galajda, who posted his NCAA-leading seventh and eighth shutouts last weekend, grew up on the campus of Toronto’s St. Andrew’s College boarding school, where his father, David, is the director of residential life. Galajda starred for the school prior to a two-year stint in the BCHL. Surging Vermont – Vermont, which was 4-15-4 just over three weeks ago, is on a 5-0-2 run and would host a first-round playoff series if the season ended today. Sophomore goaltender Stefanos Lekkas (Elburn, Ill./Sioux Falls-USHL) has starred in that stretch, posting a .945 save percentage and earning four one-goal wins. In the USHL Lekkas led the Sioux Falls Stampede to the Clark Cup in 2015. Johnny Gaudreau (Boston College) and Phil Kessel (Minnesota) rank second and tied for third, respectively, in NHL scoring. The only time two NCAA alumni finished in the top three in NHL scoring was 1990-91, when St. Louis Blues linemates Brett Hull (Minnesota Duluth) and Adam Oates (Rensselaer) trailed only Wayne Gretzky. Three games Monday night featured three hat tricks; before that the college hockey season had seen a hat trick every 14.4 games … Beanpot MVP Adam Gaudette (Braintree, Mass./Cedar Rapids-USHL/VAN) has 44 goals in his last 55 games dating back to last season … The next episode of “College Hockey Nation” will be available on ESPN On Demand Thursday, including features on Bentley’s new arena, AIC and Holy Cross … Eleven games are on national or regional sports networks between Thursday and Sunday.